Wood charcoal is basically produced for export and local market in Indonesia. However, these markets have specific requirement as to the size of wood charcoal, which is more than 3 cm. 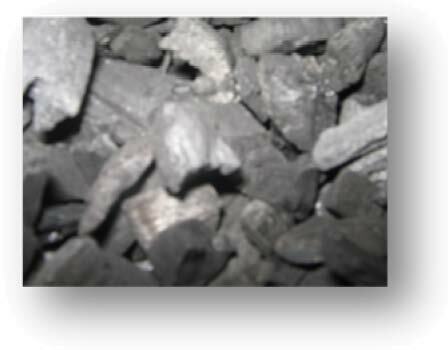 The undersize wood charcoal (1-3 cm in size) at present is not easy to sell commodity. In the province of South Sumatra, Indonesia, wood charcoal is being produced in large scale. One factory in Bilitung Island in this province, the Bilitung Charcoal Factory, is producing 120 tons of wood charcoal per month. Ten to fifteen percent of this total production consists of small or undersize wood charcoal. At present, it has accumulated 20 tons of undersize wood charcoal and the company is having a problem of its disposal. On the other hand, this waste material can be a potential source of fuel for the households in the area for their cooking as an alternative for kerosene, LPG, and wood. In order to make use of this waste material, the PT. 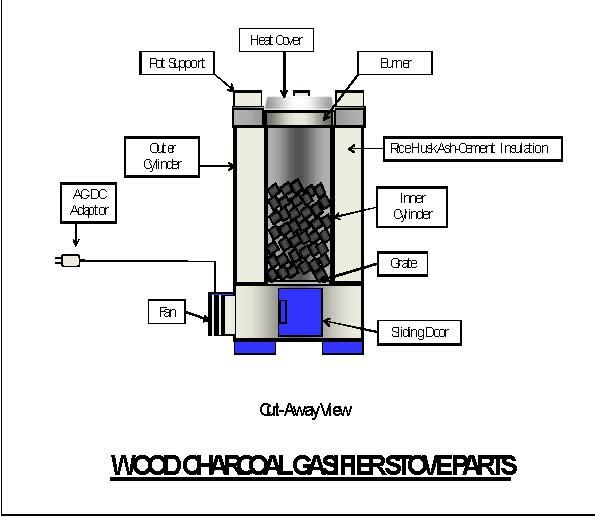 Minang Jordanindo Approtech- Research and Development Division has designed and developed a gasifier stove that utilizes this undersized wood charcoal as fuel. The wood charcoal gas stove (upper-right picture), is highly suitable for domestic use. The design of the stove is simple using locally available materials and skills in the fabrication. It is convenient to operate and requires less maintenance. It can effectively convert solid fuel into burning combustible gases for cooking and heating. It is an environment-friendly technology that can address indoor air pollution problem, particularly in domestic household cooking. Carbonized coal, wood chunks, and other small-piece agri-residues can also be used as fuel for this wood charcoal gas stove. The wood charcoal gasifier stove, as shown, is a modified version of the top-lit updraft (TLUD) type wood gas stove developed by various researchers around the world. It basically consists of the following major components: (1) gasifier reactor assembly, (2) fan assembly, and (3) burner assembly. The reactor assembly is where the fuel is gasified by supplying limited amount of air during the combustion of fuel. The inner cylinder is made of stainless steel sheet no. 304 having a diameter of 8 cm and a height of 20 cm. The outer cylinder, which encloses the reactor, is made of 0.4 mm black iron sheet having a diameter of 22 cm and a height of 25 cm. Rice husk ash and cement mixture is used to insulate the reactor. A 0.25-in. stainless steel perforated sheet is used to hold the fuel. The stove is provided with a sliding-type door for ease of removal of ashes after each operation. The air needed to gasify the fuel is supplied by a 6-cm diameter, 12-volt electric blower. An AC-DC adaptor is used to connect the blower to the AC outlet. 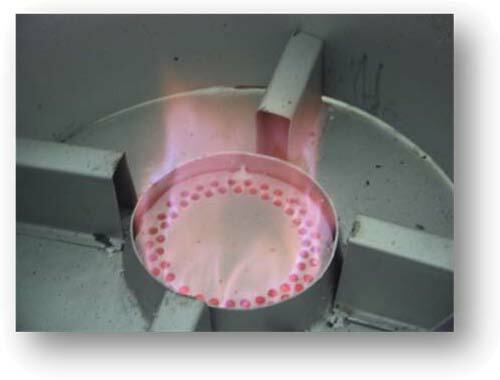 The gas produced from the reactor is released to a drum type burner where it is ignited to produce heat for cooking. Four pieces of metal sheet frame are provided for the burner to hold the pot in place during cooking. 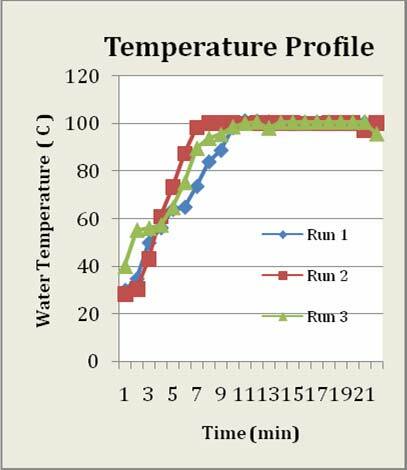 Performance testing of the stove showed that the reactor can contain 288 to 300 grams of undersized wood charcoal per load. Ignition of fuel can be easily achieved within 3 to 7 minutes using a single piece of paper. It can boil a liter of water within 6 to 15 minutes, depending on the amount of air supplied in the reactor during operation. One load of fuel can sustain 40 to 46 minutes continues operation. Adding fuel into the reactor can prolong the operation of the stove on a continuous mode. The temperature of the flame, measured at the top of the burner using a pyrometer, ranges from 400 to 450 C. No emission of smoke and foul odor was observed during the tests. The computed fuel consumption rate of the stove is 0.39 to 0.43 kg/hr while the specific gasification rate ranges from 78 to 86 kg/hr-m2. The amount of char produced after gasification is between 5 to 8%, the thermal efficiency ranges from 18 to 22%, and the power output was computed at 0.7 to 0.9 kW. The stove costs only Rp150,000.00 ( 1 US$ = Rp9,200), which can be recovered in 6 months. 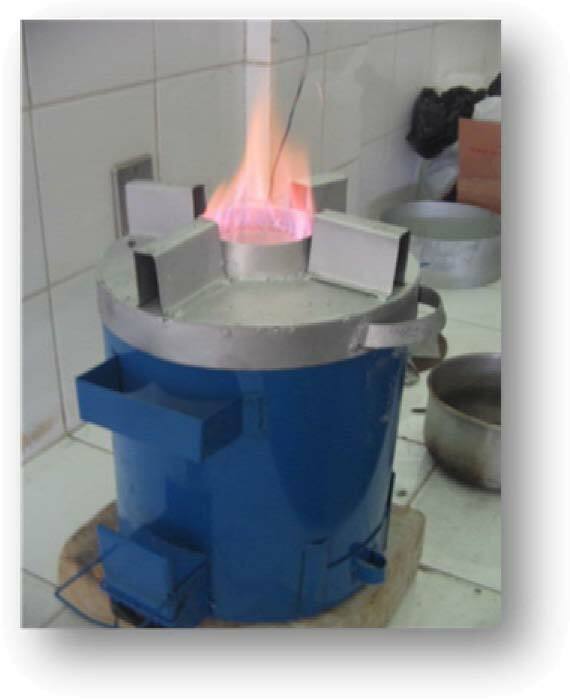 The stove was developed with the assistance of the following: Franciscus Trya Garleman and Daniel Belonio of PTMJ Approtech - Research and Development Division; and Emmanuel Ginting of Metallurgy Research Centre, Indonesian Institute of Science. Mass production of the stove in Indonesia will be done in October of this year. Interested individuals or organizations to adopt this technology may contact The President Director, PT Minang Jordanindo Approtech, ADHI GRAHA Bldg., 15th Floor Suite 1502A, Jl Gatot Subroto Kav. 56, Jakarta Selatan 12950, Indonesia. Telephone: 62-21-5262545, Fax: 62-62-215262416; and Email: djoewito@yahoo.co.id.